I've never played a Pure Salem guitar but I'm well aware of them. And I've heard that they are great for their price range. I've always associated them with Eastwood guitars in that they take familiar guitars and put a nice twist on them, or take less familiar guitars and re-introduce them to the masses. I love the top on this Left-Handed Sad Fester. Is that walnut? Or something more exotic? I've checked their website quickly and could not find one like this to find out. At $400 it would be a great guitar for any lefty. Or I could buy it and string it backwards. As a fan of Peavey and an owner of a T-60 I must admit that I've not played anything of theirs that was built after the 1980s. Not that I would have reason to avoid, I've just not seen one I'd consider trying. Then I saw this Peavey Riptide and find myself wanting to try. I like what they've done with the Tele styling and I could probably even get used to what seems to be an excessively long lower horn. At $325 Canadian I'm sure you could do worse. I've never played a Duesenberg. I feel they are more of a rare commodity in Canada, or I'm not frequenting the right music stores. I've often admired them from afar and I seriously covet their lapsteel offering with built in capo and palm benders. This Duesenberg D-Caster has a lot of familiar elements and styling, yet still maintains an original look. I specifically would like to try the spring loaded swell-pot that can be assigned to the tone or the volume. Way cooler than my kill switch. Currently listed at $2000 Canadian. I'd only ever heard of Defil guitars on this blog as Betram had posted a few great examples in the past. Imagine my surprise when one shows up in my own proverbial back yard. I love the styling of this Defil Jowita. It's unique but familiar at the same time. Defil was a Polish guitar company that started in the 1960s. 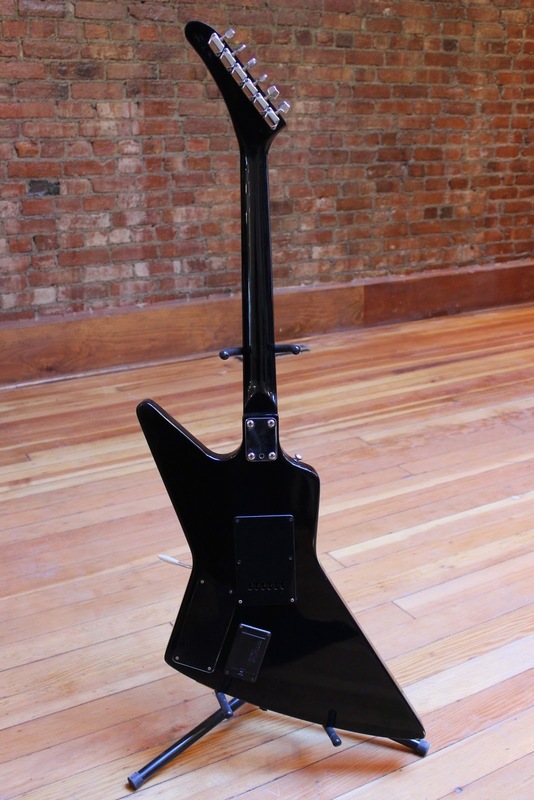 This example is from the 1980's and as the seller states "The neck is quite hefty and large". This puts it on my radar even more as I'm a fan of baseball bat necks. What's stopping me? Bloody children and their desire to eat, like everyday. I'm not a huge comic book guy, but I'm pretty sure that the person who did the artwork on this "Comicaster" tried their very best to include every comic book character in known existence. This busy graphic fails in that I suspect even the most ardent comic book fan would prefer a more focused image. I guess I shouldn't be surprised that Gretsch had made a guitar with built in effects. They are a pretty unique company in that they often try new ideas and designs yet can still maintain a reputation built on their classic hollow body guitars. This Gretsch Superaxe from 1978 comes in a very familiar orange and includes onboard phaseshifter, compressor, and sustain. It appears to be in stellar condition and should please any Gretsch fan. We've looked at 12 Sting Octave Electric guitars ( and the handsome people that play them ) in this post from a few years ago, but this is the first time that we've featured the Hammertone OC-12. I've had the pleasure to play a Hammertone and was surprised that it was quite playable and comfortable for my big hands. I was expecting more of a mandolin feel, but it actually was fairly spacious. I don't exactly love the finish on this Hammertone OC-12 but I'd be more likely to use in a studio scenario rather than live anyways. Anyone out there have one of these little beauties? "An utterly unique opportunity, possibly the rarest instrument on Ebay this week." A little research does indicate that it was a very short lived product and may not have even been officially launched. There are very few references to it in Google and only one video on youtube showing one in action. It apparently fell foul of the muscle of the mighty Yamaha Corporation, who had been developing a similar technology. "Here is something that should probably be in a museum under lock and key, a prototype Beetle Quantar guitar synth. There is some info about these online, and even a 4-5 minute clip of a guy playing one on Youtube. The basics is that this synth used ultrasonic technology to create sounds, but sadly for Beetle the mighty Yamaha Corp. were working on the same technology and a court case ensued...... Beetle lost out and faded away, and this lawsuit package then came to me directly from Yamaha around 25 years ago. There is an owner`s manual, and a covering letter from a leading Beetle employee which explains that this is a prototype and not the finished article. 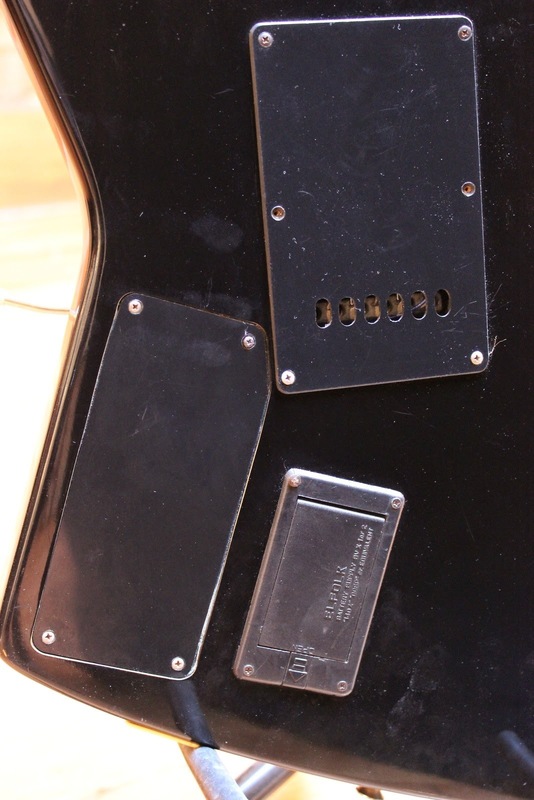 The neck is shimmed up so the strings touch it (2 photos) and the sensor / pickup. I gather the strings don`t need "tuning" like a normal guitar. There are a few dinks and marks, plus sticky tape etc in places, but this is a unique prototype. As can be seen in 2 photos, when plugged in (or fitted with batteries) the unit turns on, lights up, and all the switches and knobs work to change functions, velocity, calibration etc. Being an old fashioned guitarist I cannot get sound from it when plugged into my cheap keyboard, but flicking through the book it looks like it needs somebody better than me to set it up and work it. If you live nearby and wish to come and have a play with it, please do." I am the owner of a Roland G707/GR-700 and a couple Roland GK guitar synths so this has got me interested. I'll have to keep an eye on it and see if I can't snag it. Then it'll just be down to getting it to work with my system. Hmmm. The seller of this guitar found it in the basement and said that it was his/her father's guitar when he was a kid. It's hard to tell what the guitar is. I'm assuming 1960s Japanese but I cannot recall a guitar with a headstock nearly as big as the body. I'm at a loss for figuring this one out. Labels: Japanese guitar, What's that guitar? Handmade Custom Esquire. When cutting corners isn't so bad. I don't want to like this Custom Esquire. The crack in the wood on the upper bout has been cleverly fixed with walnut inlay and the squared off sides show that the source wood was clearly a bit too small for the template. These are both things that would bother me on any other guitar, but for some reason it's ok here. I guess the simplicity sells it for me, though at $1000 I'm not quite that sold. I've never seen the Cort Effector guitar. 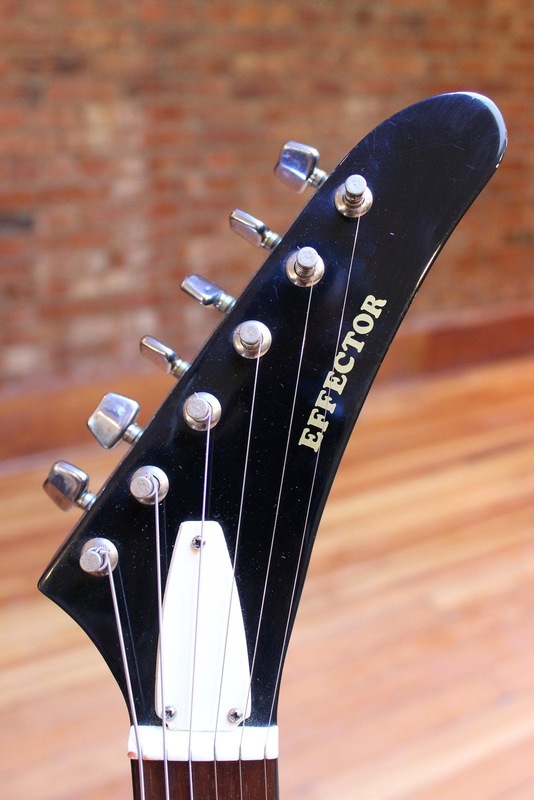 This Effector looks like a nice Explorer in its own right. Given the look of the electronics I'd assume that this guitar is from circa early 1980s. That would likely mean that it was built in Japan, and probably a pretty good player. I'm sure the quality of the on-board effects is pretty low, but they are push button on and off, and that is tres-cool. Also the Speed knob would really improve my playing, unless of course that is only for the speed of the effects. Currently listed at $180 Canadian. The seller links to this Reverb sale as a comparison, so I grabbed a couple of pictures form there as well. The Quest Atak. My internal struggle continues.